Mayor Tom Henry today announced the City of Fort Wayne will receive $33 million in federal funding for future development projects. The funding comes from New Markets Tax Credits, which are designed to spur economic development in low-income areas. 310 organizations nationwide applied for the tax credits but only 87 were awarded a total of $3.5 billion from the U.S. Department of the Treasury. Fort Wayne is the only Indiana entity to receive the funding. "This is a major win as we continue to see unprecedented momentum in our City. I want to commend our City employees for their tremendous efforts in assisting us in receiving these financial resources," said Mayor Henry. "The new funding positions our community for additional economic development opportunities and new jobs to make Fort Wayne a business investment and quality of life leader in northeast Indiana and the Midwest." Fort Wayne Mayor Tom Henry is encouraging local residents to take the online Riverfront Fort Wayne Uses and Activities survey. The survey can be found at www.riverfrontfw.org\survey and will take just a minute or two to complete. It is available online through June 20. The Riverfront Uses and Activities survey is designed to collect input about how Fort Wayne residents would like to see the downtown riverfront developed; the responses will be provided to the City's riverfront consultant, SWA Group. The survey includes ten questions that focus on the importance of elements like housing, natural habitat space and recreation opportunities. The Ash Brokerage Corporation and Hanning & Bean Enterprises development, which will continue the positive momentum and transformation of downtown Fort Wayne and bring new jobs to the community, has reached a milestone with the signing of development agreements. The agreements are contracts that allow the City of Fort Wayne to move forward with seeking approvals for the publicly funded portion of the project. The public-private partnership includes a new national corporate headquarters for Ash Brokerage, a residential component led by Hanning & Bean Enterprises, retail space, and a publicly owned parking garage. The Fort Wayne Redevelopment Commission today announced that Justin Brugger will be the Commission's new director. In addition to serving as the Redevelopment Commission Director, Brugger will also manage the staff of the Redevelopment Department within the Community Development Division.Brugger took the position previously held by Greg Leatherman, who now serves as the City's Community Development Director. Brugger's first day on the job will be May 14. Fort Wayne's extreme winter season is pushing back the start of Neighborhood Code Enforcement's weed program. The winter's low temperatures and heavy snow have delayed the growth of grasses and weeds, so instead of starting the first week in May, the weed program will now begin Monday, May 19. Weed complaints will also be accepted beginning May 19; the public should call 311 or 427-8311 to report a possible violation where weeds or grass exceed nine inches. 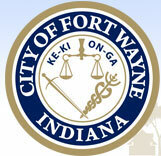 Online complaints may be filed at www.cityoffortwayne.org/citizen-services. Individuals reporting a violation will need to have the property's specific street address to register the complaint. Do business with the City? Ask a question that is not here? Find Fort Wayne City Demographics?